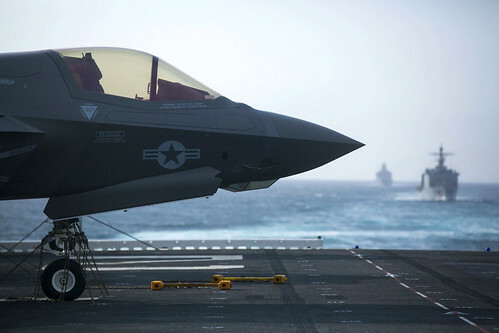 PACIFIC OCEAN - Sailors of the Essex Amphibious Ready Group (ARG) and Marines attached to 13th Marine Expeditionary Unit (MEU) completed ARG/MEU exercise (ARGMEUEX) off the coast of Southern California, May 10. ARGMEUEX is a Carrier Strike Group (CSG) 15 and 1st Marine Expeditionary Force, Expeditionary Operations Training Group (EOTG)-led exercise that provides critical training and feedback prior to the deployment certifying event, composite training unit exercise (COMPTUEX). Essex ARG is commanded by Capt. Gerald Olin of Amphibious Squadron (PHIBRON) 1, and comprises amphibious assault ship USS Essex (LHD 2), amphibious transport dock USS Anchorage (LPD 23), and amphibious dock landing ship USS Rushmore (LSD 47). Embarked commands include the “Blackjacks” of Helicopter Sea Combat Squadron 21, Assault Craft Unit 5, Naval Beach Group 1, Beachmaster Unit 1, Fleet Surgical Team 3, and Tactical Air Control Squadron 11. Marine Col. Chandler Nelms commands 13th MEU, which consists of the command element; the aviation combat element, Marine Medium Tiltrotor Squadron 166 (Reinforced) and Marine Fighter Attack Detachment (VMFA) 211; the ground combat element, Battalion Landing Team 3/1 (Reinforced); and the logistics combat element, Combat Logistics Battalion 13. During ARGMEUEX the Essex ARG and 13th MEU applied the lessons learned from last month’s PHIBRON and MEU integration (PMINT) exercise to continue to facilitate enhanced integration, lethality and collective capabilities of the Navy-Marine Corps team. In order to ensure combat readiness ARGMEUEX used real-world scenarios that spanned warfare area and joint mission settings. Some of these complex exercises included maritime interdiction operations, anti-piracy operations, close-air-support, air assaults, reconnaissance and amphibious operations. "We continue to grow as a team. During ARGMEUEX we validated that we can plan and execute complex missions. We are capable of maintaining air and maritime superiority, and at the same time conducting either crisis response or amphibious operations that project combat power ashore" said Nelms. "We have come a long way, and we are looking forward to certify for deployment." The upcoming Essex ARG and 13th MEU deployment will also mark the first combat deployment of the F-35B in the U.S. 5th Fleet area of operations. The Lightning II provides transformational warfighting capabilities for the ARG/MEU team, making it a more lethal and survivable forward-deployed, crisis response force. The embarked Sailors and Marines logged numerous hours of flight operations, performed amphibious loading and unloading, conducted damage control drills, and multiple replenishments-at-sea. This ARGMEUEX also marked the first time a West Coast based ARG used a live virtual constructive (LVC) training environment. LVC allows trainers to replicate a complex maritime environment by utilizing synthetic injects. “When it comes to creating complicated training environments, there is a lot of required coordination and limitations associated with using real-life platforms to simulate the adversary’s air and water-borne threats,” said Cdr. Kieran Mazzola, CSG 15 LVC lead. Watchstanders on all three ships across the ARG using LVC saw computer generated tracks and signals that matched adversary platforms input into their operating environment. This augmented reality training allows ARGs to train for a high-end fight scenario while maintaining awareness of real-life maritime traffic. The Essex ARG and 13th MEU will certify for deployment during their upcoming COMPTUEX prior to a regularly scheduled summer 2018 deployment as the Navy and Marine Corps’ forward deployed, crisis response force.